This sample db demonstrates handling of form controls in distinct groups in such a way that actions meant for a given group get performed across all controls belonging to that group, without having to process any loop for tackling individual controls. This functionality is achieved via class module named C_ControlGrps. Grouped controls get assigned to a collection, as instances of this class. (a) Permanent grouping via control's tag value assigned at design stage. (b) Dynamic grouping allowing the user to add / remove controls to any of the groups as desired, at run time. (a) Manipulation of default values group-wise. (b) Locking / unlocking of controls group-wise. (c) Restricting tabbing to a particular group as desired. (d) Hiding / un-hiding of groups as desired. (e) Manipulation of back colors group-wise, via slider bars for R/G/B color components. (f) Special effects - This involves a continuous cycle of smooth transition of shades for the back color, interspersed with periodic swapping of back colors between the two groups. This sample db demonstrates an appointments planner featuring audiovisual alarm for events becoming due. The Planner opens with appointment grid pre-selected for today's date and the cursor moves to current time slot. If any other date (not older than yesterday) is selected in the Date Picker control, fresh appointment grid for that date is presented (if not already existing). When put into standby mode, the utility goes into minimized state and keeps scanning the status of scheduled appointments at specified time intervals. As & when an event becomes due, an audio alarm is sounded accompanied by a pop-up form displaying the current status of various appointments. The time in advance of an event for sounding the alarm, as well as the frequency of scanning is amenable to customization by the user. Audio alarm is governed by the *.wav file located in the same folder as that containing the sample db. If it is desired to use a different sound, simply replace this file by the one desired. (a) An activex control named 'Microsoft Date And Time Picker Control' has been used in this database. This control is required to be registered in the access installation on user's computer, before attempting to open & use the sample db. (b) For registration - file mscomct2.ocx should be available in System32 folder of windows operating system. Open any access database other than this db (even a blank one will do), click Tools -> Activex Controls -> Register. Navigate to the location of above .ocx file and click OK.
Access 101: How Do I Find The Path and Filename For My Database? This article has moved here: How Do I Find The Path and Filename For My Database? This utility program allows you to convert an Excel spreadsheet file which contains 'flat-file' data into one or more tables in an Access database. The program creates primary and foreign keys in the tables so that 'One to Many' or even 'Many to Many' related tables can be created automatically. You just import the Excel file into the program, create a template which tells the program which columns in the spreadsheet should be copied to which fields in which tables, click a button and the program will extract the data into a series of separate tables which can then be exported to a new database via .csv files. The program can also be used to create properly 'normalised' tables from data in MS Works or any other database by first exporting the data to an Excel spreadsheet (or .csv file which can then be imported into Excel). Full instructions are included. This version runs under Access 2000 and Access XP (2002). Access 101: How Do I Replace System Error Messages With Custom Messages? 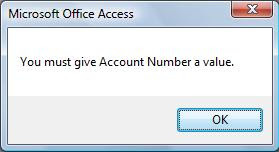 Access provides a number of error messages, but many are confusing to the users. I find it sometimes useful to replace the system error messages with custom error messages. The Null primary key is a case in point. When you try leave a record on a form without a primary key value, the form will display the following error. But you might want to replace this with your own error message, identifying the actual field. MsgBox "You must give Account Number a value." 3058 is the error number for the null primary key. The "Else" section will let any other error display the normal system error message. If you want to know the number for another error, just un-comment the msgbox and you'll get the error number. Add any additional errors as an ElseIf. Access 101: How Do I Bypass Start Up Options? This article has moved here: How Do I Bypass Start Up Options?